With great leisure facilities, food and views, Essex Golf and Country Club Hotel is on the outskirts of Colchester and is a 15 minute drive from Braintree Village. All residents receive free use of the swimming pool, sauna, steam room, spa bath and gym. Reduced rates are also offered for tennis court hire and golf. Additional facilities include a 9-hole, 12-bay floodlit driving range and free Wi-Fi throughout the hotel and club. Essex Golf & Country Club also has on-site beauty and hair salons. Many of the spacious en suite bedrooms have excellent views over the Championship golf course. All rooms have a flat-screen TV with Freeview and free toiletries. The closest hotel to the shopping outlet. With free parking and family-friendly rooms, this Premier Inn hotel has an on-site Foulers Farm Inn pub-restaurant, serving traditional meals and a range of real ales and wines. All of the rooms at the Premier Inn have an en suite bathroom, a TV and tea/coffee making facilities. Some rooms can take 2 adults and up to 2 children (under 16 years). The 2 children also get a free full breakfast when accompanied by an adult eating a full breakfast. The hotel is just a 2-minute drive from the A120 and Stansted Airport is 16 miles away. 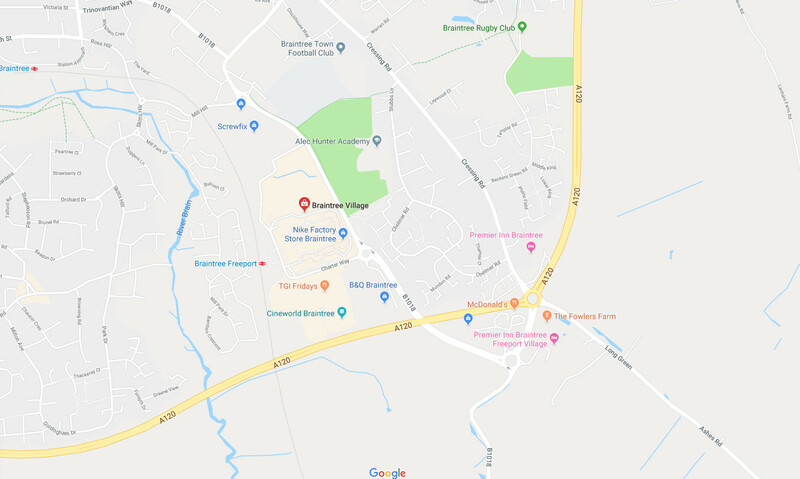 We’re situated less than a mile away and Braintree town centre can be reached in less than 10 minutes by car. Situated on the edge of Braintree town centre, the Holiday Inn Express is just 2 miles from Braintree Village. It offers a 24-hour reception, free parking, and free Wi-Fi, along with a bar and restaurant. The air-conditioned rooms at the hotel feature a flat-screen TV and tea and coffee making facilities. The en suite bathroom boasts complimentary toiletries. In the morning, guests can help themselves to an Express start breakfast at the Holiday Inn Express Braintree. If you want a rural, calm and comfortable B&B conveninetly located to Braintree Village and all transport links, you’ll find it all at Homelye Farm Courtyards. Situated only 15 minutes away in beautiful countryside, their 13 en-suite converted barns offer fresh, bright and clean accommodation with individual character, and each room has its own private entrance from the farm courtyard so you can come and go as you please. Their comfortable accommodation, full English or continental breakfast (served in the beautiful Granary) and free parking ensures that you’ll have a hassle free, pleasant stay. Free Stansted airport parking is also available with flexible check-in/out times by arrangement, offering a secure place to keep your car without the expense or inconvenience of airport parking. Just a 20 minute drive from Braintree Village, and a stone’s through from Colchester’s historic city centre, the Best Western Marks Tey Hotel offers free Wi-Fi access and free private parking. Guests have free access to the leisure club and there is also an on-site restaurant and a hair and beauty salon. The Lifestyle Health & Leisure Club is complimentary to residents during their stay and facilities include a 15-metre indoor swimming pool, and steam and sauna rooms, fully air-conditioned gymnasium and 2 outdoor tennis courts. Beauty treatments are available for an additional charge. The elegant lounge and cocktail bar provides the perfect meeting place and somewhere to relax before dining in the splendid Brasserie Restaurant, which offers a selection of international cuisine, complemented by carefully selected wines from around the world. Colchester Zoo is within a 10-minute drive of the hotel and the Tiptree Jam Factory can be reached after 20 minutes’ drive. With contemporary style and comfort within an historic listed country house, this privately owned hotel sits discreetly amid 75 acres of parkland, just a 20 minute drive from Freeport Braintree. Partially surrounded by a moat, Prested Hall offers 15th and 18th century interiors, stunning Art Nouveau decor and elegant 1930s extensions. During health club opening hours, adult guests are welcome to use the 20-metre indoor pool, sauna and steam room, and, subject to a fitness assessment, the well-equipped gym. There are also outdoor lawn tennis courts and scheduled times for family swims. With 13 attractive en suite rooms, a separate luxury room, an adjacent health club and established events facilities, the owners of Prested Hall have attempted to create a place of quality, where comfort, style and relaxation exist without cold formality. Sunday lunch, afternoon tea and evening meals are available at Prested Hall, and local ingredients are used wherever possible. Hotel guests will find helpful staff and attention to detail, with fresh flowers throughout the house, along with books to browse through, DVDs to borrow, real coffee in the rooms, breakfast house specials and, always, the pleasure of being away from city stress amid beautiful surroundings.